Suspension of Spanish Judge: Victory for Impunity ? A Spanish Judge, Baltasar Garzón, 54, was suspended for allegedly abusing his authority - by launching an investigation into "crimes against humanity" committed during the Spanish Civil War and the dictatorial era of General Francisco Franco. Judge Garzón launched the probe, ignoring widespread criticism from right-wing organisations and Franco supporters. He made it his mission to investigate the forced disappearances of more than 100,000 people in Spain. Right-wing organizations criticized Garzón for overstepping his judicial power, and a complaint was launched against him. Under mounting pressure, the judge suspended the investigation, but the complaint against him led to his suspension, on 14 May 2010. Is the suspension of judge Garzón, a victory for impunity? 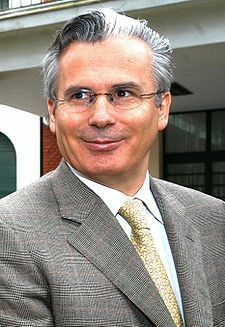 Baltasar Garzón is famous for his role in high profile international investigations into grave crimes. Garzón was also behind the arrest and trial of 24 al-Qaeda operatives in 2005, and the conviction of an ex-naval officer from Argentina, in Spain, for crimes against humanity. As a Spanish judge, Baltasar Garzón sent a strong message in favor of international criminal law, with a considerable amount of success in international investigations. Unfortunately, an attempt to investigate "crimes against humanity" committed at home, earned him a suspension. There has never been an investigation into untold atrocities committed during the Franco era in Spain. This is partly because in 1977, parliament granted amnesty for the atrocities. Despite the amnesty, many questions about the crimes, remain unanswered and many citizens are longing for justice. This explains why Baltasar Garzón enjoys the support of people of conscience in Spain and abroad. In Spain, Garzón enjoys the support of left wing organizations, and family members of Franco-era victims; many of whom need answers. No doubt, there were demonstrations against the judge's suspension. The suspension is widely seen as the end of a commendable career, as well as a victory for impunity. Judge Garzón lashed out against impunity and represented a threat to perpetrators of atrocities against humanity. Garzón helped deliver justice to victims of grave crimes, both in Spain and abroad.